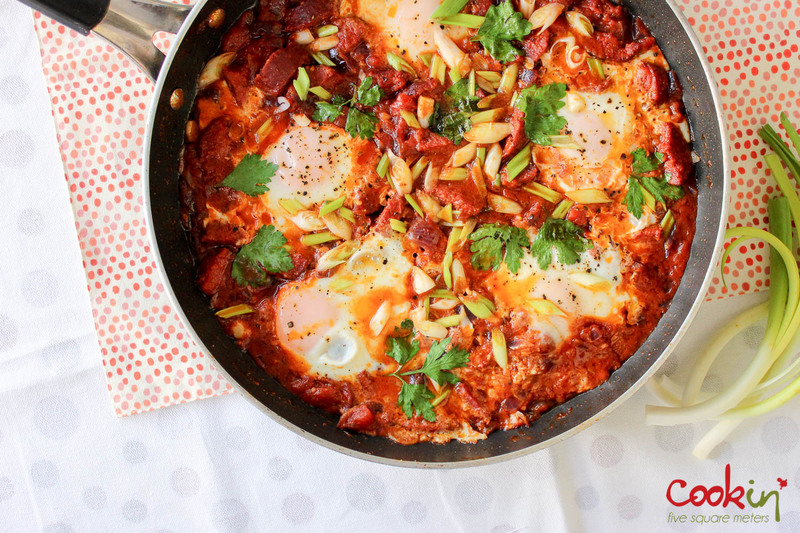 My love for shakshouka is real. A real love story. Or in the terms of food writers; it is a perfect marriage of ingredients and flavors. Jokes aside, it is. If you haven’t tried it at least once, you’re missing out. Apparently I make a really good shakshouka regardless of the ingredient variations I use that friends or a friend of my sister to be precise calls for it whenever she’s visiting. I wouldn’t say no, mostly because it is easy to make. Normally I start off by a glug of olive oil and garlic to flavor it. This is when I add the meat, spices, and other vegetables – if added – before pouring in the tomato juice and left to simmer and thicken. All that is a preparation, a cradle, a whole life’s-culmination of bubbling only to host those clear and yellow parcels of protein and fat. I love how beautiful they look once they start to coagulate and firm up but the yolks remain yellow and slightly runny. This entry was posted in Breakfast, Lebanese, Lunch, Palestinian, Recipe and tagged anchovie, anchovies, breakfast, breakfast for many, breakfast idea, caper, capers, easy breakfast, egg, eggs breakfast, group breakfast, palestine, palestinian, palestinian shakshouka, sausage, shakshouka. Bookmark the permalink.